A pair of peregrine falcons which have made their home on the roof of the old Citibank building in Molesworth Street have returned to roost. 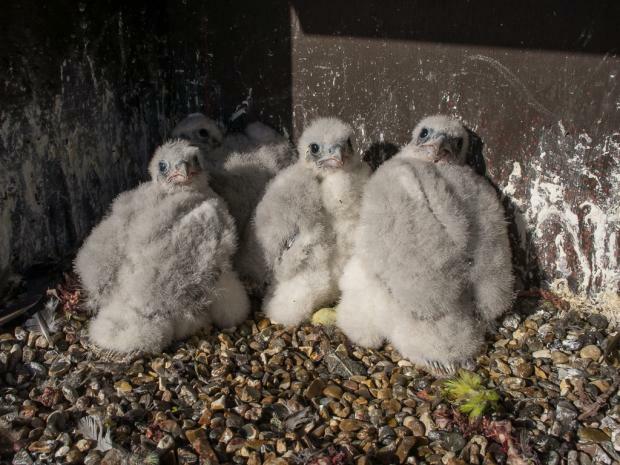 The couple have become the proud parents of four chicks and nest site monitor John Chapman from the London Peregrine Partnership is keen to make people aware of what to do if they see a chick out of the nest. He said: “People have a habit of moving them, we do not want that. “We want people to ring us and we can come along and pick the bird up. Mr Chapman added the best place to see the chicks and their parents would be in front of the police station. Under UK law it is a criminal offence to intentionally or recklessly kill, injure or take a peregrine falcon. If anyone spots a peregrine falcon chick out of the nest they should call John Chapman on 07894 030938.